Recently, humanity has created what may be one of the single most significant alterations to the natural world ever. Three Gorges Dam (TGD), the largest in history, recently completed in China, brings with it many social and environmental concerns. In terms of the former, the Dam has displaced many already socioeconomically vulnerable communities, putting strain on the social fabric of the area and, in the process, drawing our attention to issues of structural violence. In terms of environmental concerns, Three Gorges makes the area far more vulnerable to ecosystem disruption through erosion and landslides, among other things. 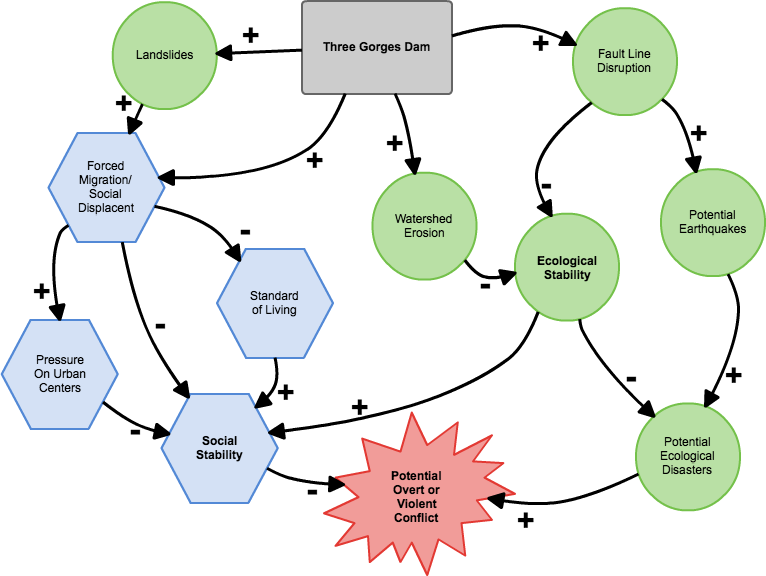 This case study explores the implications of the Three Gorges Dam in the context of human alterations to local climate and resultant conflict. Unlike most other studies of climate change and conflict in this database, this study explores highly localized and human created climate change. This study does not examine global, diffuse, and slow climate change, human caused or otherwise. Instead, I look at ways that humans can drastically alter their immediate environment and the implications from such alterations. Three Gorges Dam is a perfect example of this relationship since its effects are localized and immediate and wholly the cause of humans. 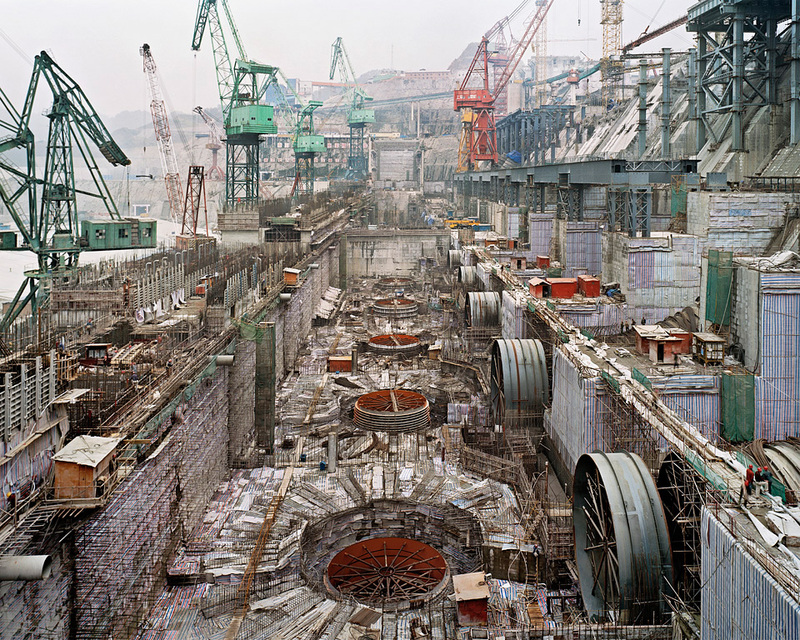 In 2006, the Chinese government completed a decades-long construction on the worlds largest dam ever. Situated in Central China, the Three Gorges Dam is 1.4 miles lang and 604' tall, over 5 times as large as the Hoover Dam (Handwerk 2006). TGD is fed by the Yangtze river and its 26 turbines provide 18,000 megawatts of power. Holding back enough water to slow the rotation of the earth, it is a testament to human ingenuity and architectural prowess. And while the Dam provides roughly 3 percent of the country's energy needs, it has come at great costs both environmentally and socially. These costs, moreover, feed one another insofar as social displacement puts further stress on the cities and towns that must now support the displaced and environmental degradation of the area surrounding TGD and nearby stretches of the Yangtze river equals a loss of resources for China in general. These include arable land, biodiversity, medicinal flora, and valuable topsoil, among others. The Three Gorges Dam, according to some, has the potential to be one of China's largest environmental nightmares (Hvinstendahl 2008). 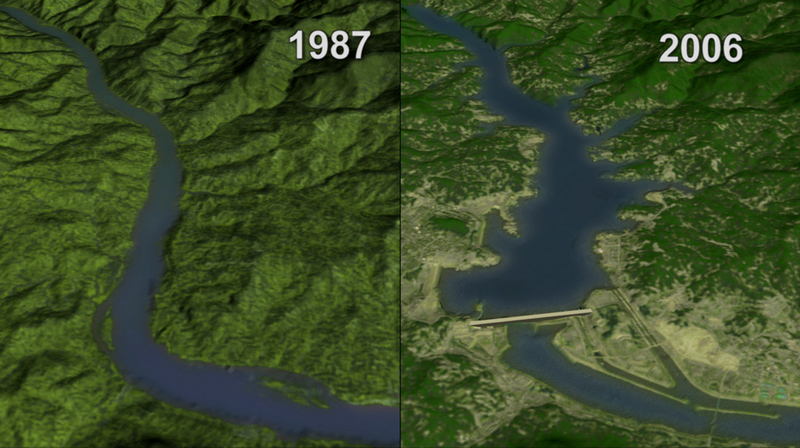 That said, one of the most immediate environmental effects of the Three Gorges Dam has been an increase in landslide activity. This results primarily from erosion caused by the drastic increases and decreases in reservoir water levels, which, when at their peak, create a body of water almost as long as Britain (Watts 2010). Furthermore, landslides in the surrounding areas have been much worse than had been predicted and dozens of people have already died as a result (Gleick 2009). Another major issue with the Dam is the ways in which it is affecting biodiversity in the area. Animal and plant life has been greatly threatened due to flooding in some habitats and water diversion in others. Furthermore, fragmentation of habitat may lead to heavy losses of biological diversity (Jianguo et al. 2003). As one author has compellingly shown, fragmentation leads to species insularization by creating virtual islands, which confound processes of ecosystem stability and biological enrichment (Quammen 1996). Fragmentation of habitat, moreover, is disturbing the reproduction patterns of many species, suggesting that if they haven't disappeared yet, they soon may. Whether one agrees that this means a loss of spiritual and cultural wealth, it undoubtedly means a loss in resources that might otherwise have been tapped. Examples might include medical plants, among others. It should be no surprise that the river system downstream has also been affected. Decreases in freshwater flow has meant that more saltwater is creeping up the Yangtze, endangering fish populations already threatened by overfishing (Hvinstendahl 2008). This again signifies a loss of valuable resources. There has also been a 50% loss in sediment and nutrients downstream, a common issue with most dams, which will cause erosion to river systems, wetlands, and seacoast ecosystems, leading to adversely impacted fisheries and wetland watersheds (Handwerk 2006). Lastly and frighteningly, the Dam may have been tied to major earthquakes, including the one in May of 2008 which killed 87,000 people (Associated Press 2011). By placing tremendous pressure and fluctuation (by rapidly raising and dropping water volume) on the underlying geological plates, TGD arguably increases seismic activity. Proving that this leads to increased earthquakes, however, is more difficult (Naik et al. 2009). Still, there are already detectable increases in seismic activity. Below, the reader can see the massive scale of the Three Gorges Dam. As the largest dam in the world, it is no surprise that it has had a major environmental impact on the surrounding area. Indeed, its massive size has required 28 million cubic meters of concrete, 463,000 metric tons of steel, and 26 massive turbines. In terms of the discussion here on climate and conflict, all of these environmental concerns ultimately operate to increase stresses on the social fabric of the surrounding communities as well as the urban zones to which the displaced migrate. The most important effect that the construction of the Three Gorges Dam has had on Chinese society has been the displacement of millions of people from the Yangtze river region. In order to establish the reservoir, hundreds (possible thousands) of towns and villages were evacuated and later submerged. Importantly, the area surrounding the Yangtze contains some of the densest clusters of human life in the world. This should give one a sense of the immense impact of flushing out this area of its inhabitants. Those forced to relocate were promised compensation for the value of their homes and land. In many cases this deal has been fulfilled without a problem. In what is likely the overwhelming majority of cases, however, relocated citizens have either been given far too little in compensation or their dues have been slimmed through corruption and embezzlement. Compensation in some instances has been as meager as the equivalent of $7 a month, and many claim they have received only half the land compensation they were promised (Hvinstendahl 2008). This has meant problems for many as the cities and towns they have had to move to are more expensive, driving many people deeper into poverty (Yardley 2007). Indeed, there is a major concern that the displaced will be made even poorer due to landlessness, joblessness, marginalization, and food insecurity (Gleick 2009). The displaced are more often than not farmers with little formal education, if any. This spells trouble for any attempts at social mobility within the major cities. Many have instead opted to return to the Yangtze region. Those who stayed or who returned due to poor living conditions elsewhere (of which there are many) face different types of challenges. Flooding the reservoir has forced those farmers still in the region to migrate northwards up the mountain slopes, adding to erosion through over utilization of top soil (Yardley 2007). Many displaced, moreover, are now stuck in tents, their homes destroyed either during construction or in the wake of a landslide, without enough money to rebuild. Natives to the Three Gorges region are not the only adversely affected Chinese citizens.Those who live far downstream are affected by pollution (Associated Press 2011). And people all across central and eastern China, including those in China's largest city, Shanghai, are feeling the effects of drought thought to be tied to TGD (Hvinstendahl 2008). City dwellers are further affected by the social pressures of accommodating hordes of migrant workers. Outside of the TGD scheme, another 22 million people have been relocated to make way for hydroelectric projects in China as of 2007 and as many as another 4 million may eventually have to be displaced as a result of surrounding effects of theTGD (Yardley 2007). At the heart of the issue is the idea that relocation leads to societal stress. As one author poignantly put it, "demolition and forced relocation are the biggest flashpoints for social unrest in China...With an estimated more than 180,000 protests per year in China, that's certainly not lost on a government that now spends more on domestic security than its military budget" (McLaughlin 2011). Ultimately, these flashpoints are key and compelling indicators of structural violence. Structural violence is characterized by the oppression of disadvantaged people at the hands of cultural, political, legal, or economic practices and tradition (Winter 2001). This form of violence is practically invisible insofar as it is institutionalized and normalized by daily experience. Racist, sexist or classist policies are prime examples of structural violence. By forcing Chinese citizens out of their homes and into generally much worse situations, into poverty and degradation, the state regime is committing acts of structural violence. This invisible violence, moreover, is a leading cause of overt violence. While the situation has not deteriorated to such a degree yet, the stage is set. More dams will mean more displacement, which will mean more social unrest. Outraged citizens, already engaged inÂ hundreds of thousands of protests to date, may eventually take their grievances to the next level, in classes with authorities or other forms of overt violence. The image below shows where the coast line of the Yangtze river lay before the filling of the Three Gorges Dam reservoir. This coastline was populated with hundreds of villages which are now solidly submerged in water, and the red thumbtacks show how where people lived before the Dam and the extend of their land which has been lost. Potential disasters will only exacerbate societal unrest. Sitting atop two major fault lines, the Jiuwanxi and the Zigui-Badong, TGD seems ripe for disaster. Indeed, putting such a massive dam in a heavily populated area - which is also home to delicate ecosystems - criss-crossed by fault lines is a recipe for disaster. Ultimately, this controversial dam is made all the more worrisome by the degree to which Chinese officials have downplayed and ignored potentially catastrophic concerns. As hydrological expert Dr. Philip B. Williams points out, officials who were responsible for the safety analysis of TGD have underestimated potential earthquake ground accelerations; they have underplayed the risks of spillway factors as well as risks of major landslides; and they have ignored risks of dam failure downstream and downrange (Williams 1990). They have also left much to be desired in their analyses of structural stability and seismic activity. What will it look like if the Dam were compromised, with millions living downstream? And could the regime handle such a catastrophe? Issues of duration surrounding issues of the Three Gorges Dam are twofold. In terms of construction and the following social dislocation, the duration is at least 18 years. Construction began in 1992 and the relocation of villagers from the area, 1.5 million total, continued through 2010. More may soon join the ranks as landslides continue to be an issue. As regards environmental issues, they are ongoing and will continue to be so as long as TGD is operating. The Three Gorges Dam is situated squarely in central China. Its environmental impacts, however, reach much further downstream in the forms of erosion, ecosystem degradation and landslides. Its social impacts affect many surrounding areas, namely urban centers. And while all major effects of TGD are presently found only in China, they could spread in the form of social migration, in response to environmental and social pressures, to neighboring states. Still, this has yet to become a pressing concern, if ever. Presently, the only relevant actors are the Chinese government and Chinese citizens who have either been displaced due to construction of TGD or who now must share urban space with the relocated. All Chinese citizens are affected, it must be mentioned, by the mere fact that China is better able to provide energy to its people because of TGD. This effect, however, is passive, and less relevant to a discussion of climate change and conflict. In the future, as has been eluded to, other regional actors may enter the scene if social and environmental issues continue to mount. The international community, moreover, will almost certainly get involved if there is an instance of dam failure or a large earthquake resulting, arguably, from the geophysical pressures of TGD. The image below gives the reader an illustration of the extent of the environmental effects. Here we can see how far up the mountain sides the reservoir extends and thus how much land is affected by landslides and erosion, which ultimately stem from water-caused degradation. The Three Gorges Dam is situated in and surrounded by a temperate zone. The local habitat and its resident fauna and flora are, furthermore, under great stress due to the presence of TGD. Deforestation, insularization, and habitat loss are increasing pressures on the native species of plants and animals, many of which are already endangered. This conflict centers around the relationship between citizens and the state regime. It is characterized at the moment by issues of structural violence whereby the state is oppressing its citizens through forced migration and resultant poverty. Violence is not currently overt and neither has the international community involved itself to any relevant degree. As such, this conflict is internal and structural. If conditions worsen for the displaced (whose ranks are due to swell immensely) the situation may become overt and international actors may get involved. As of yet, however, this is merely speculative. Should violence become overt, it will be over access to resources, whether it be jobs, water, food, land, etc. It may also erupt in response to protests over lost homes and forced migration. There have been no recorded deaths directly related to clashes surrounding the politics of the Three Gorges Dam. As mentioned, however, the potential is there. Still, many have lost their lives in the drama of the Three Gorges Dam. Directly, over 100 people died in the construction of the Dam. Indirectly, dozens have died as a result of landslides in the area (wordpress.com) and 87,000 people died in a 2008 earthquake potentially caused by geological pressure from TGD (Associated Press 2011). As mentioned above, the environmental and social stresses relating to TGD are interconnected. Environmental degradation leads to an impoverished society, desperate for natural resources such as land and water. An impoverished society is plagued by societal stress and, often, mismanagement of resources fueled by poor socioeconomics. It is a sad irony that it is often the poorest people who do the most damage to their environment. As such these situations can be conceptualized as feedback loops where degradation in one area fuels degradation in the other and vice versa. The image below provides the reader with a visual representation, albeit simplified, of the complex issues surround the Three gorges Dam. Factors are color-coded whereby green factors signify ecological issues and blue ones signify sociological issues. Beginning with the left, the Three Gorges Dam project is causing forced migration of many people both directly due to Chinese government policy as well as indirectly through landslides and erosion. Furthermore, forced migrants put pressure on urban centers insofar as they need housing and jobs that may not necessarily be available. This in turn affects the standard of living by contributing to poverty, among other things. All of this acts to erode social stability, which is itself a form of latent conflict and which is requisite for violent of overt conflict. On the right hand side we see that TGD disturbs fault lines and causes watershed erosion, both of which negatively affect ecological stability. Furthermore, TGD is believed to be connected to earthquakes in the area due to its massive size. All of these disruptions signal the potential for grave ecological problems such as ecological collapse, biodiversity loss, erosion, etc. Presently, this issue is concentrated almost entirely between the state sub-state level. International actors are involved in an indirect way (Anti-Dam Movement, for example). But, as of yet, there are generally irrelevant in this particular issue. Winners include the Chinese citizens who receive power from Three Gorges as well as state officials who can currently claim the Dam project a success. Losers include the displaced and oppressed citizens who have lost their land and houses and livelihood. This issue is still playing out and the final outcome of the Three Gorges Dam saga is still undetermined. 5. Jianguo Wu, Jianhui Huang, Xingguo Han, Zongqiang Xie and Xianming Gao. 2003. 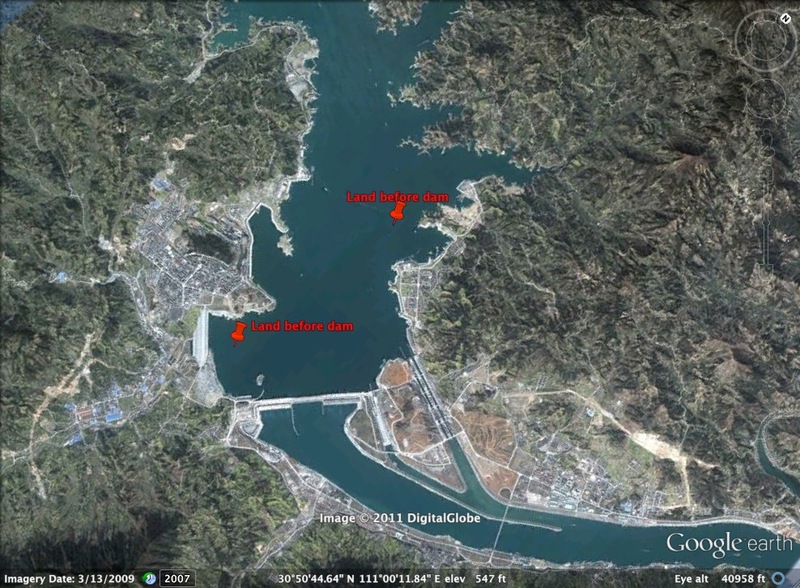 "Three-Gorges Dam: Experiment in Habitat Fragmentation?" Science 300 (5623): 1239-1240. 6. Quammen, David. 1996. Song of the Dodo: Island Biogeography in an Age of Extinction. Scribner: New York. 11. Winter, D.D. and Leighton, D.C. 2001. "Structural Violence" in D.J. Christie, R.V. Wagner, and D.D. Winter (Eds. ), Peace, conflsict, and violence: Peace psychology in the 21st century. New York: Prentice-Hall.